I've mentioned this previously, but the last month and a little earlier was a mess for me. I was covered by a veil embroidered with anxiety about death and the fate of the world. In my despair and confusion, the soundtrack full of lofi hip-hop beats from YouTube, I read about an artist called SPELLLING and her own dreams of alien life and other words. Her new album is called Mazy Fly, named after a seemingly gentle spirit of the air. The album resonates with my recent feelings. Let me tell you about it. The cover art shows SPELLLING glowing amongst an audience of curious cattle, seemingly referencing the correlation between alien visitations and livestock. Her glow gives her an otherworldly quality that the cattle are picking up on. There's also a contrast to The Beach Boys famous Pet Sounds akin to The Clash's London Calling contrasting with Elvis' self-titled album. There's the same kind of text formatting and song list, but while The Beach Boys were standing up feeding the animals, SPELLLING is on the floor amongst them while simultaneously also wearing a cowboy hat. Does technological progress make us the cowboy or put us out to pasture? 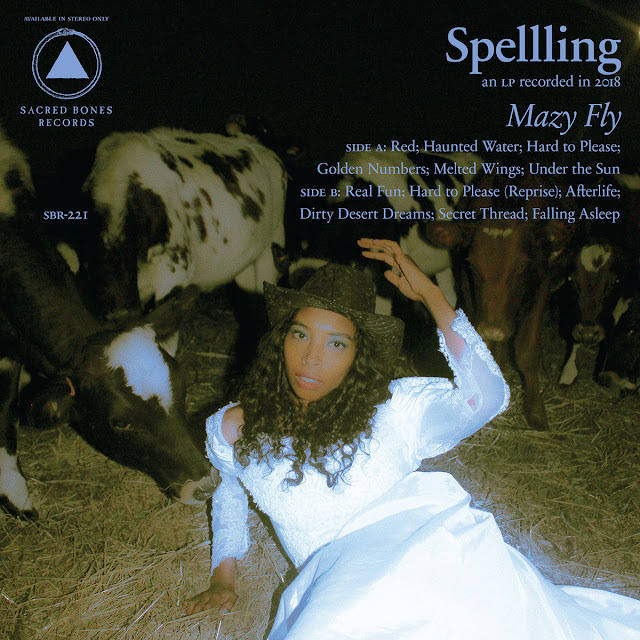 Mazy Fly by SPELLLING The first track, "Red" starts out warbling, vinyl grain, before transferring into a psychedelic, hypnotic Bowie/Yoko Ono pseudo-R&B murmuring. "Haunted Water" comes in with a fantasy journey of synthesizers and drum machines, a song of the Lady of the Lake. The rhythm of the vocals reminds me of "Bridge Over Troubled Water" by Simon & Garfunkel, though that's just a shadow on the surface of something that runs deeper. The various instrumental layers create something that comes from one side of the night, somewhere under the stairs or in a dark closet, something that you hear through walls covered in static. On "Hard to Please" I hear the haunting voices of sirens in a cavern that is mostly submerged. That beat that runs across the surface has a nice solid 'thump' to it. "Golden Numbers" is beautiful, swooning, off-kilter post-war pop. "Melted Wings" is eerie stuff, synthesizer wind painted on by dark strings. "Under the Sun" finishes Side A with a vision of the future in spacy ambiance and near-electro. SPELLLING's techno-prayer inspires me with confidence against my own fears of cosmic voids. A damp wah-soaked guitar drips down my sight as "Real Fun" starts. This one is explicitly about aliens, musical organs rising up to signal the new age as the air stirs and kids cry out. The song elevates into a dramatic Stooges crescendo before turning in to something like The X-Files. "Hard to Please (Reprise)" opens with a Prince-ish pseudo-pop cheer, a call to the aliens to take her with them (like when the purple one himself sang "Take Me With U" to Apollonia). Prince himself sang about the afterlife on "Let's Go Crazy", and the next song is about just that. This one has more of the Stooges melodrama with saxophones and droning guitars. This song speaks to me after all of the reading I've been doing about metaphysics, religion, and quantum mechanics. "The cavities in my brain are growing a garden," has so many meanings after all of my studying. "Afterlife" is airy, spacey, and mixed with heavenly vocals. I think "Afterlife" would have made a good ending, but the album keeps going, as we do. "Dirty Desert Dreams" has a more melodic Nico and maybe a bit of Nancy Sinatra. SPELLLING's vocals cross the skies before the song erupts into a funk jam that fades out. The calm "Secret Thread" goes more into the afterlife visions of "the sky at night" and speaks about the "Mazy Fly" who lives up in the clouds. This is what ties the whole thing together, soft chambers to distorted strings and more. And at the end, "Falling Asleep" combines heavy club beats with childhood chimes. Are we butterflies dreaming of being humans? Mazy Fly is a truly experimental album combining funk, 60s pop, electro, ambient, and New Age in the spirit of Prince or David Bowie. The stories told here about aliens, technology, and the search for lands beyond, both metaphorical and physical and maybe even metaphysical, are as old as time, but SPELLLING has brought new meaning and life to them on Mazy Fly. Mazy Fly receives a Good.